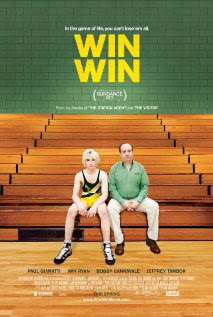 Similar to Mr. McCarthy’s two previous films, Win Win (2011) offers up a riff on the age-old theme: “don’t judge a book by its cover.” He has a knack for commingling characters from disparate walks of life – different cultures, different socio-economic backgrounds, different generations, etc. – and then forces them to come to terms with each other in a way that underscores our collective humanity. There are no superheroes here, no effects, nothing even remotely showy; this is a modest, down-the-line character study that’s so intimate and honestly observed, so authentic feeling in its depiction of a rural East Coast middle-class lifestyle, and so effortless in its evocation of the trials and tribulations of mundane everyday life that I was warmed to the core. Paul Giamatti, in yet another deft, deeply empathetic embodiment of the average schlub, anchors the film as Mike Flaherty, a small town New Jersey lawyer/high school wrestling coach who makes one bad, desperate decision and does his best to manage the fallout. Feeling the financial squeeze of our times, Mike takes on the legal guardianship of an aging client, Leo Poplar (Burt Young), whose mental capacity is slowly fading, in order to collect an extra $1,500 a month in income from Leo’s wealthy Estate. But Mike then shuffles him off to an assisted-living facility against his true wishes. When Leo’s grandson shows up, whose very existence Leo is unaware of, things get interesting. Amy Ryan is wonderfully forthright as Mike’s wife and newcomer Alex Shaffer dazzles (in an incredibly naturalistic debut performance that’s aided by expert editing) as the wayward teen who's thrust into their lives. The less you know about it going in the better, but the movie is funny and tender, tragic when it needs to be and the execution is near flawless. I don't think it ever misses a beat. Jeffrey Tambor, Melanie Lynskey, and Margo Martindale round out the cast. Everytime I see Bobby Cannavale in a movie or on TV, I perk up a bit. He's got movie star looks, a warm presence and a delightful sense of humor. The man can do no wrong. And seriously, we know Giamatti is a great actor. So why does he continue to surprise us year after year? I can't wait to see this one. I absolutely *loved* The Visitor and The Station Agent, and can't wait to see this movie!! I'll be waiting for it to hit DVD so I can see it with captions -- I'd be very surprised if it was one of the few open captioned movies offered at our local Marcus.